While Philippe and Louis oversaw the structural interior renovation, Renee and Aunt Sophie combed the surrounding area for artists and talented trades people who would do upholstering, furniture refinishing, and other design work. They also were interested in finding sources for antiques and collectibles. Sophie was invaluable. Her contacts were up?to?date and the people they visited, invariably eager to be involved. The family of Sophie's late husband Claude, had lived in the area for more than two centuries, so many of the older firms knew of the family name and were pleased to be asked to be a part of the launching of Renee's new business venture. 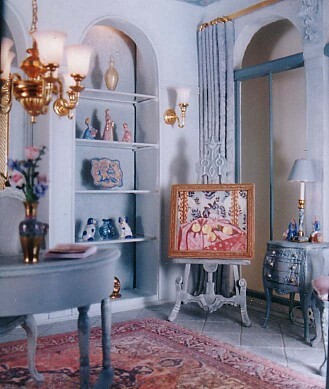 Fortunately Louis had not exhibited his paintings locally, only in Paris, so Renee was pleased when he offered to show some of his work in her new studio. In addition to showing original works of art by other local artists, Renee would offer interior design services specializing in fabric applications. Even though she had spent two years designing fabric for the House of Fortuny, she thought helping clients choose fabrics and accessories for their interiors would be far more interesting. Creating the interiors of their own hideaway on the island and then Sophie's little bed and breakfast Chateau, confirmed Renee's desire to work with fabric in relation to interiors rather than fabric design alone. Sophie's admiration of Renee's talents and confidence in her ability to work well with clients was very important to Renee. Sophie was fast becoming a wonderful friend and encouraging mentor. Claude's death years ago, so unexpected and so tragic was very difficult for Sophie and teenager Louis, but they supported and drew strength from each other. Sophie was a handsome woman, still young both in her appearance and her attitude about life. She was quick to credit her son Louis and his suggestion to refurbish the elegant old Chateau as a bed and breakfast, for restoring her lively nature. Renee was surprised that Sophie had not remarried but perhaps that was still ahead. Renee's reveries were suddenly interrupted when the little bell attached to the front door sounded the entrance of a visitor. Renee could hardly believe her eyes when she looked at the slender dark haired young woman who entered. "Suzanne!" exclaimed Renee, happily embracing her former colleague from San Francisco. Suzanne turned to introduce the familiar looking young man who had come in directly behind her. "I'd like you to meet my husband Paul." Renee immediately recognized his smiling face from the recent wedding photograph Suzanne had sent. Renee had been unable to attend their wedding because of her involvement with the final preparations for the opening of the studio. Suzanne and Paul explained that they were combining a European honeymoon with a trip to Vienna to attend a piano concert by Suzanne's sister Cynthia. They also were going to stay a night at the Chateau LaCage on the way to the Cote d'Azure. Philippe and Aunt Sophie had made the arrangements for Suzanne and her husband, but had kept it a secret to surprise Renee.